Welcome to Paw Paw Palooza! If you are wondering What is a Paw Paw or Pawpaw? you have come to the right place! 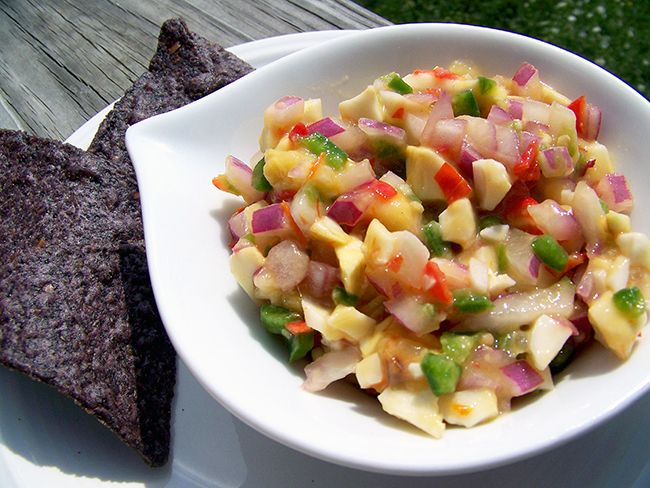 Paw Paw Palooza Salsa Recipe – Muy Caliente! Paw Paws, sweet and custardy, are a fall flavor as familiar to me as the rustle of leaves in autumn. I am amazed how many are strangers to this native fruit. As Friends Drift Inn resumes Paw Paw Palooza, it is my hope you will seek out Paw Paws and give them a try. For me, the sweet dessert recipes were easy Paw Paw Ice Cream, Paw Paw Waffles, and Paw Paw Crème Brule were safe bets. But sometimes, I want to walk on the wild side; just need someone to guide me along. If I were an expert in Nuevo Latino Cuisine, maybe I would be more imaginative. I’m not; but I know someone who is. A quick facebook conversation with chef Anthony Lamas of Louisville’s Seviche yielded a fun and exciting twist for Paw Paw Palooza. Paw Paw Salsa – it’s sweet, it’s spicy, it’s HOT! Chef Lamas suggests a Paw Paw Salsa served with grilled swordfish. I think the salsa is amazing with pork as a side garnish. For the weekend tailgate party crowd, Paw Paw Salsa would certainly wake up the all too predictable corn chips. Paw Paws with a Latin kick; I could get used to this! Thanks chef Anthony Lamas! Update! Check out chef Anthony’s new book! 1. Peel, deseed and cube paw paws. 2. Add onion, peppers and lime juice. Stir in minced cilantro to taste. I used about 2 tablespoons. 3. Refrigerate for at least 2 hours, allowing the flavors to meld. Use as a side garnish to fish, chicken or pork. Makes a fun dipping salsa for afternoon tailgates!